Where to go in Geneva when you want to eat the best fondue in winter, celebrate the carnival in March, listen to music and drink coffee while watching the sun rise after an all nighter, or even just for the famed after work apéro? Why to a public pool, of course! The Bain des Pâquis has been a public pool since 1890, 18 years after its creation, and has remained in the city’s and the people’s hands ever since. It was renovated in the thirties, threatened by destruction at the beginning of the eighties, finally saved by Genevans in 1988 and renovated again. During all this time, it has always been a place where anyone could come and go, feel welcome, hang out with friends and family, and partake in numerous events, such as short film festivals and concerts, offered by the Bains. There is also a sauna, hammam and Turkish baths as well as spaces for women only. You’ll always find something to do there, people to watch, swans to be scared of. 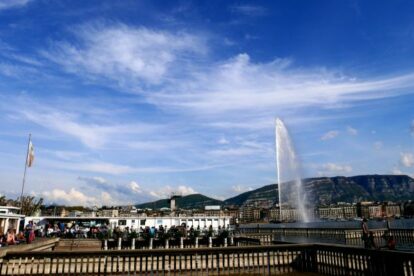 It is one of my favorite spots in the entire city, I spend a lot of my summer Sundays there, enjoying a refreshing late afternoon drink or a dip in the lake, with my friends and the people of Geneva for company. And sometimes I just go for coffee and some Jazz before going to bed.